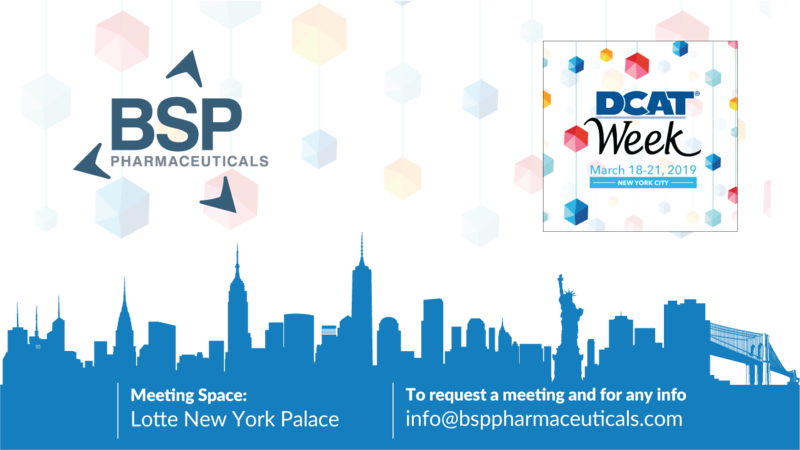 BSP Pharmaceuticals S.p.A. is proud to announce Its presence at the next DCAT Week in New York City. DCAT Week is the premier business development event for companies engaged in pharmaceutical development and manufacturing and related industries. It is organized and hosted by the Drug, Chemical & Associated Technologies Association (DCAT), a not-for-profit, member-supported, global business development association whose unique membership model integrates both innovator and generic drug manufacturers and suppliers of ingredients, development and manufacturing services, and related technologies. Held annually in March, DCAT Week ensures that members have a forum for high-level strategic meetings with key decision makers, timely educational programs, and important networking opportunities. DCAT Week education programs bring together leading industry experts who provide timely market analysis, best practices, and key insights on the issues shaping the pharmaceutical/biopharmaceutical industry, its manufacturing value chain, and related business functions (i.e., sourcing, procurement, and supply management). DCAT Week offers companies the opportunity to host private meetings with customers, suppliers and potential business partners in their reserved Business Meeting Space.